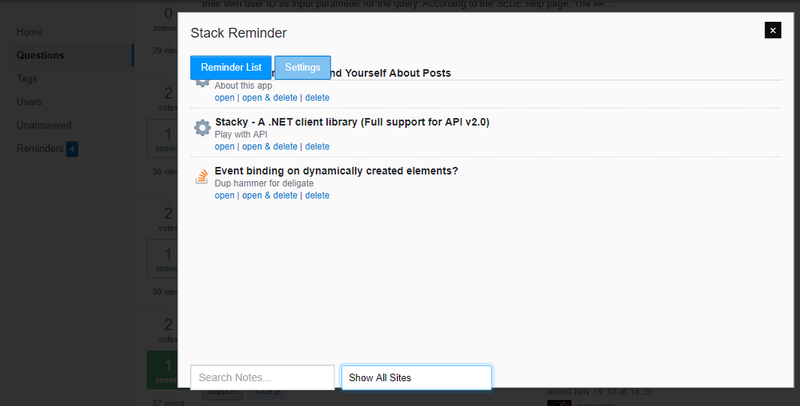 Stack Reminder allows you to save questions/answers to a special list, each with their own custom flag to remind you why you wanted the reminder in the first place. This tool is a great resource when you are browsing around Stack Exchange, but cannot contribute until later. This will let you mark anything you would like to come back to later. See feature "Site Filter" below. If you have more common uses to add to this list, please let me know! Site Filter: By default only show content marked on the website you are currently visiting, with a dropdown to switch between sites or show "All"
Stack Reminder hooks your reminder list into my API service, which will allow you to access your list from any computer, or even share your list with other people. First, you'll need a user script manager, such as Tampermonkey. You'll need to generate a free API key on the Stack Reminder backend, then install the userscript. Once the userscript is installed, it will pop up a prompt requesting your API key. View your reminders list, with a search bar and options to filter by site. 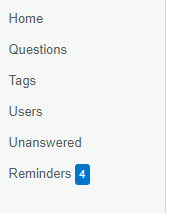 This interface is reachable from any page in stack exchange that shows the sidebar. The "Site Selector" will default to only show posts from the site you are currently on in the network. If you can think of any ways to make this better, let me know on GitHub or here in the comments. This was written based on a users suggestion. 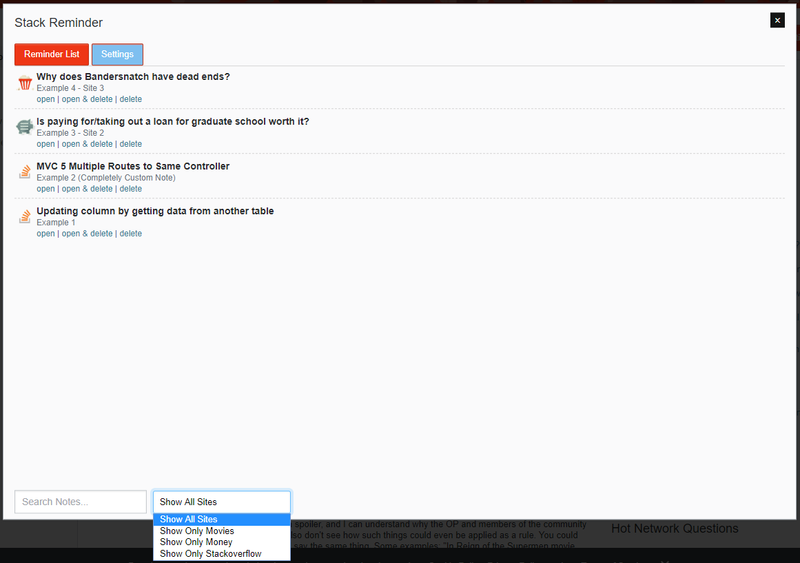 Jan 17) Most recent update changed some visuals, and added an "options" tab, where you can purge all of your marked posts and easily send ideas/suggestions. Can the button please not have the color: red; style? The red button is pretty distracting for a feature I only use occasionally, and all of buttons of the other userscripts I use look identical to the existing share, edit, and flag buttons. I don't mind adding some sort of styling after I've already set a reminder, but I'd prefer for the feature to not to stand out so loudly until I interact with it. Can you change the Settings button color style to the blue from the "Post Your Answer" and a lot of more buttons always and just add a blue-ish border when clicking it? Like most buttons that don't do dangerous stuff, it uses some sort of blue color and add a blue-ish border around it when clicking it. Button Reminder List and Seetings are not in there appropriate place. Show All Sites gives wrong result. I have 4 question on Reminder but Show All Sites option show only 3 result.